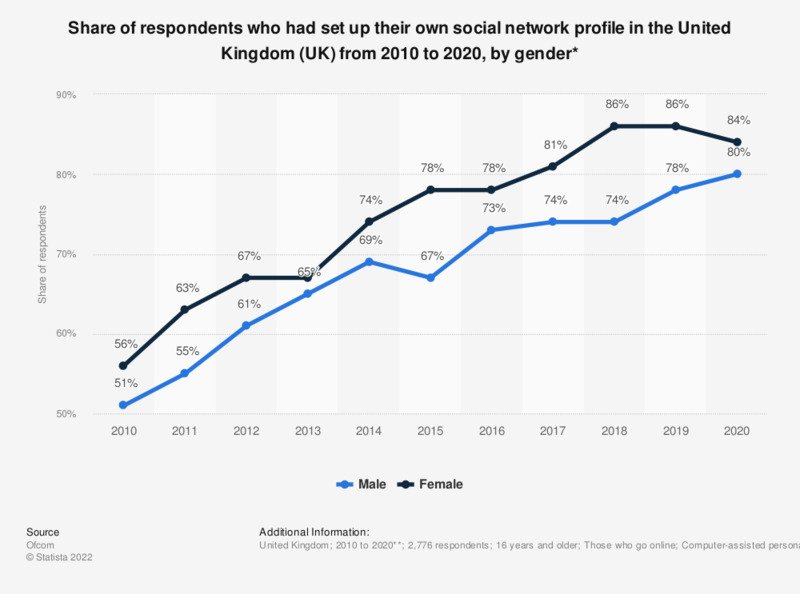 This statistic illustrates the findings of a survey among internet users regarding the creation of social networking profiles in the United Kingdom (UK) between 2010 and 2017, broken down by gender. Over the period in consideration, the share of female respondents, who reported creating a profile on any social media site increased from 56 to 81 percent. During the most recent survey period in 2017, it was revealed that 74 percent of male respondents set up a profile on social networking platforms, an increase of six percentage point in comparison to the previous year. In the demographic group of the 16 to 24 year olds, 91 percent had social network profile in 2015. * The original survey question was: "I’d now like to ask you some questions about social media (DESCRIPTION OF SOCIAL MEDIA). Do you have a social media profile or account on any sites or apps?" ** The most recent survey was carried out 31 October to 13 November 2017. Data for years previous to 2013 were published earlier by the source. The source indicates that, "The way in which the question was asked of adults was amended between 2012 and 2014, which could account for some of the differences shown."